Unfortunately I was not able to track down the X-Files / Ghostbusters: Conspiracy issue to read it. Reading this issue made me hugely disappointed that I missed it, even more so then I already was. It’s not because I jumped into the issue lost in the story either; actually it was super accessible still even having missed one. This issue was just so fantastic that I really hate that I missed the last one, and now really can’t wait for the Transformers crossover issue coming next. This is the best comic I read this week period. The Lone Gunmen are continuing their search for answers about the super virus that is set to hit in the near future and their hunt leads them to New York’s sewer system. Unfortunately for them the Turtles have left New York City for North Hampton, on the run from the Foot Clan. Luckily for them, a pair of amateur journalists trying to snap a photograph of a reported vampire cult sighting in North Hampton instead land a picture of Leonardo, which the three see on the internet. Heading to North Hampton, the picture of Leonardo and reports of vampires combine together for the Gunmen to assume the turtles are vampire “manphibians,” and potentially the carriers of the virus they are searching for. After hacking phone records, Langley finds that the victims of the reported vampires all had ordered from the same pizza location soon before their death. Needing a blood sample, the three lay and wait in an alley in front of the pizza parlor in hopes of catching the Turtles. Wanting to get some time away, Casey and April leave the Turtles to go out on a date alone to the same pizza parlor. The Turtles follow to make sure the two do not run into trouble, which of course they do. The pizza parlor is a front for the vampires and the two are attacked. The Gunmen and Turtles converge inside together to find the shop owner ready to strike. The rest of the vampires converge inside as well and fight the Turtles. As the Gunmen hide behind the counter, Langley calls Mulder and explains to him the situation, one Mulder and Scully had been in before. The vampire running the shop was Ronnie Strickland, from the X-Files episode Bad Blood, along with the rest of the vampire cult and Sheriff Hartwell. He tells them to throw seeds on the floor and the vampires will compulsively need to pick them up. They find some chili flakes and toss them into the center of the room. Sure enough the vampires stop fighting the Turtles to pick them up. Sheriff Hartwell is able to fight the urge and yells at the other vampires that they need to flee. With the vampires gone, the Gunmen explain to the Turtles about the virus they are searching for and ask for the sample of their blood in hopes to engineer a possible vaccine. The Turtles are reluctant to believe them though, and leave with April and Casey. As the Gunmen drive away towards their next tabloid story connected to the virus, Leonardo has a change of heart and stops them. They show him all of their data, along with news reports that the virus has already started to spread. He agrees to help them before they leave to meet the Transformers next issue. The issue was vastly entertaining. Seeing the Gunmen meeting the Turtles was a real treat. It is not a crossover I would ever have expected (which the same can be said for all of these issues) but it works very well. Not only that, but had the addition of tying in one of my all-time favorite X-Files episode, Bad Blood. It has been so long since I’ve seen the episode that I didn’t realize what was happening until the call with Mulder. After that though, I flipped back a few pages and everything clicked and got me super excited. It was a great nod to a great episode. I’ve really enjoyed Michael Walsh’s work on the X-Files: Season 10, but having him draw the Turtles was even better. I really wouldn’t mind seeing him drawing even more of the Turtles in the near future. Jordie Bellaire must follow with his colors as well, they fit the Turtles perfectly. 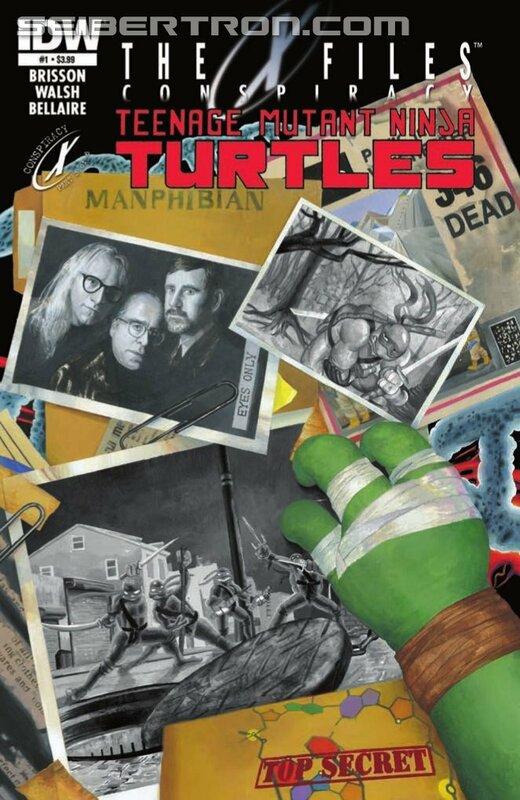 If you think the Lone Gunmen meeting the Turtles is weird, you wouldn’t be wrong. It is something unique though that even my wildest imagination wouldn’t have dreamed up. I’m happy IDW did though, because they are putting out one of the best crossovers I’ve read in years. The original announcement of this series was bittersweet for me. Scarlet Spider had been one of my favorite series and it was a real shame to see that it was canceled. Yet here we are, Christopher Yost is writing this as well which allows Kaine to web his way into this series, right where he left off in the final Scarlet Spider issue. It wouldn’t have been right for this to just focus on him though, and Yost smartly gives a first issue that gives everyone a fair amount of page time. The issue’s first page leads with a quick prologue of what appears to be a Minotaur, crawling away leaving a trail of blood behind him and bodies all around. The one who apparently led the slaughter follows him. The Minotaur asks why, and revealed is the High Evolutionary who proclaims they did nothing wrong, but for humanity to survive, he must die. It then turns to Justice and Speedball in New Salem, under attack from the super powered individuals, the Salem Seven. They stop fighting long enough to realize that it was a misunderstanding started by Speedball, as he assumed that one of the Salem Seven was a villain, based of his devilish looks. The leader of the Seven, Vertigo explains to Justice that New Salem is a safe haven for all magical creatures and that her team are their protectors. The peace of the city does not last long though as androids descend down, declaring that blood in the town is tainted and will be burned away. Meanwhile, things pick up for Kaine and his friend/sidekick Aracely right where Scarlet Spider ended, with them in Mexico. Aracely hears tourists being robbed in an alley way and demands they go save them. Kaine is reluctant, but the two take down the thieves before going on their way. They make their way to the beach for some rest and relaxation, but this is cut short. Dead Atlanteans begin washing ashore and Namora steps out of the water requesting heroes. In New York City, Sun Girl is on patrol, stopping an armored car heist. As she flies away, she picks up a police report that there is a disturbance in Grand Central Terminal. She arrives to see an explosion come from below. She rushes in to find the same androids from New Haven massacring the Morlocks. Finally Nova is in New Mexico battling an alien who is seeking Thanos’ power. Nova has the upper hand until the alien transforms into a young boy. This is enough for Nova to stop attacking. The alien is about to attack but is blasted in the back and killed. Nova begins to thank his rescuer, but it shot unconscious by the High Evolutionary who is with the androids, who he calls the Evolutionaries and says are the saviors of the human race. For a first issue, it sets things in the right direction for all of the heroes to eventually come together as they face the same threat. I am interested to see what the High Evolutionary is up to. The team appears well rounded and it will be interesting for them to come together, especially with Scarlet Spider as he is a reluctant hero and more of a loner. It does seem strange to have a New Warriors with no Night Thrasher, but I really don’t like Donyell Taylor anyways. Plus, I know that he hasn’t worn it for a while, but Yost needs to find a way to turn Speedball into Penance again, just saying. This happens to be Marcus To’s first Marvel comic and I think this series is a nice fit for his pencils. The art is consistent throughout and he does a great job drawing all of the heroes. I’m not sure how I feel about David Curiel’s colors though, he makes it a little too bright for the darker story Yost is telling. It’s vibrant enough for Speedball’s personality when he’s on the page, but not for when anything none human is being killed on the page. 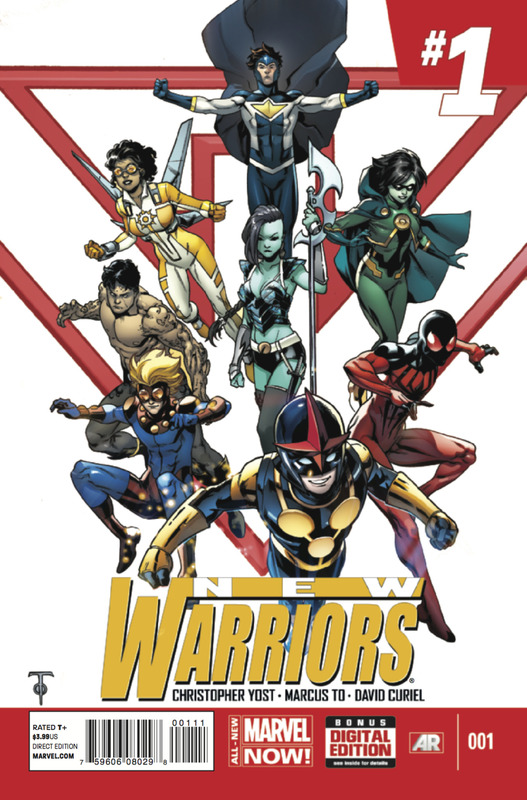 I never was a New Warriors fan during their initial series and the last volume was pretty dreadful. Yost having the reigns really sold me on it though as everything he does has been fantastic so far. Luckily I wasn’t disappointed as this first issue was a solid way to get things going to form this new iteration of the team.